In India 70% population is depend upon agriculture, it becomes imperative for the work to be well planned and managed. In the era of Globalization and scientific advancement, agriculture has acquired the character of a business. Rajasthan is economically, socially and industrially a developing state. We have tried to collect and present data on farm cost and investment, agriculture income and accounts-after a survey of all Rajasthan. 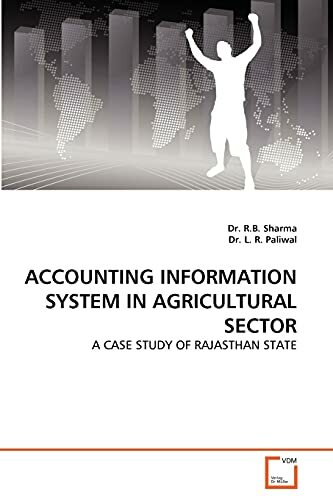 Analysis of facts and figures related to accounting and cost management is based on interviews with 135 farmers belonging to different parts of Rajasthan. The conclusion of the study, that the agriculture activities must be carried out as village levels and not at farm level. It is suggested that all efforts should be made to maintain the same engagement of the population in this sector and the agriculture sector be provided with necessary entrepreneurial leadership (may a corporate form of management) which is capable of offering necessary capital and efficient management. Dr. R. B. Sharma, is Assistant Professor of Accounting at the Kingdom of Saudi Arabia. He is a multidisciplinary personality and had a brilliant academic career. The co-author Dr. L. R. Paliwal is Associate Professor in Commerce, Swami Shraddanand College (University of Delhi), India. His areas of specializations are Accounting & Finance.